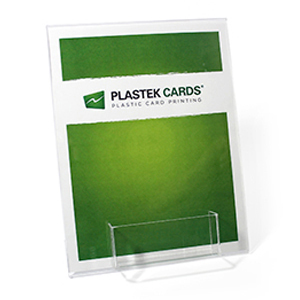 Gift Card Display Stand | Clear Acrylic | Large Pocket | 8.5"x11"
8-1/2″ x 11″ high display with pocket. Graphics slide in for easy change out for promotions and holidays. The 4.5″ wide x 1.5″ high pocket is centered on the display, and can hold carriers and/or cards.